A stunning display of color and fire radiates from this attractive engagement ring. Its colorful flair will immediately capture your attention and awe your visual senses. The center of this outstanding piece radiates with a very good cut .50 carat brilliant round cut diamond. This diamond shimmers like tiny fireworks and has a clarity of SI2 with a color grade of G.
Additional round cut diamonds are set down the open shank and side profile of the ring. This creates a glitter attribute that shines with fire at every angle. 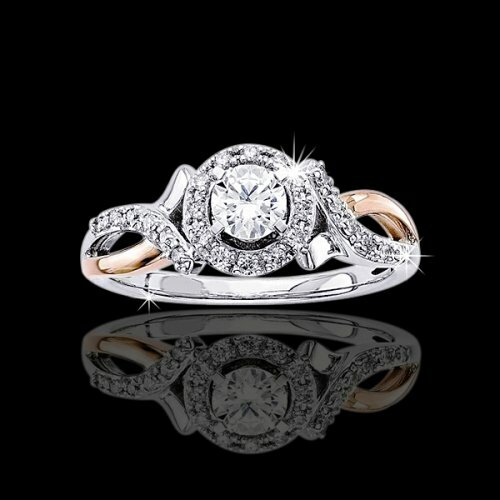 Delicate scroll cutout designs accent the side of the ring. Stunning undercarriage design adds additional character. The side diamonds in this piece have a total combined weight of .20 tcw and match perfectly with the center stone. This eye-catching ring measures 4mm wide and is made of 14kt white and rose gold with a total metal weight of 3.96 grams. *Note* Gold weight may vary due to ring size.